This book club business is good. I have actually read a whole other grown up book and I wasn't even on holiday. 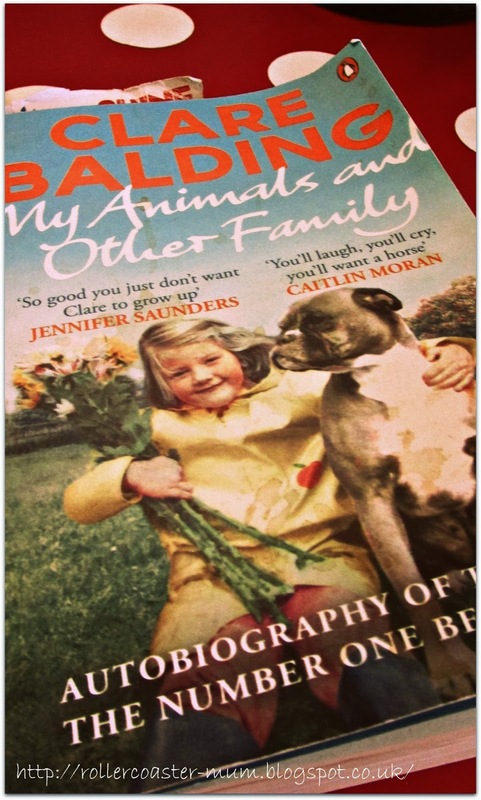 The book club in question is the Britmums book club and the book this time was 'My Animals and Other Family' by Clare Balding. Now I am not normally a biography kind of person, I've read the biggies like Nelson Mandela's and such but I don't tend to gravitate towards biographies. However I was drawn to Claire's firstly because of the title - I used to love Gerald Durrell's books when I was younger and his book 'My Family and Other Animals' is hilarious. Secondly Clare always comes across as a properly normal sort of person despite her slightly posh upbringing and celeb status. As with most books these days it took me a while to read but this was no reflection on the writing. The book is written in a relaxed, humourous style and although the book is themed through her animals it is mostly about her rather eccentric family and Clare's life as she grew up. You get a great idea of what they were like, warts and all. From her father who undoubtedly shaped her as a person despite not really appreciating her, to her slightly scatty mother who once forgot to get her from boarding school and her quite frankly terrifying sounding Grandmother. Clare is sympathetic (and obviously still very fond of her family) despite being brutally honest about what they were like. This is by no means a kiss and tell type biography (thank goodness - can't stand all that celebrity gossip nonsense), although I am sure people in the horse racing world would recognise a few people and she does mention the Queen occasionally (especially visiting them for breakfast) and how she managed to upset Princess Anne. It really is all about her growing up rather than her life since she went on telly fo which I am very glad. I am sure there may well be a sequel in there but not sure her honesty would go down as well with the sports stars that she must have met. Disclosure: I was sent the book for free as a member of the Britmums Book Club but all view and opinions are my own.